We created a simple video that walks you through step by step of hooking up a PJ bumper pull trailer. This video covers basics like raising your trailer jacks, lowering the coupler on to the ball, attaching safety chains & breakaway kit, and latching the Bulldog coupler. We also recommend you review your truck’s owners manual for an additional instructions or precautions related to your specific tow vehicle. 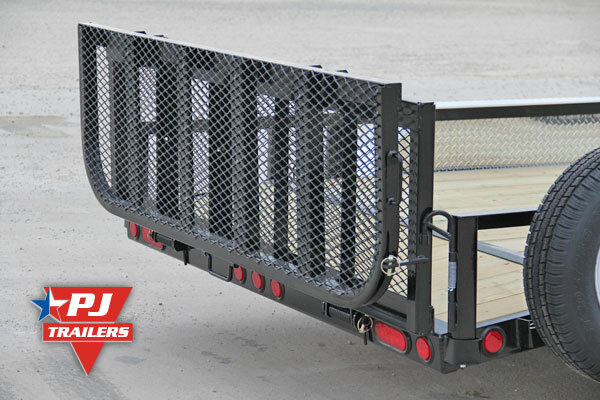 Our gooseneck trailer customers absolutely love the genuine Hutch Suspension for its extreme durability, adjustable torque arms, million mile bushings, and other low maintenance features. 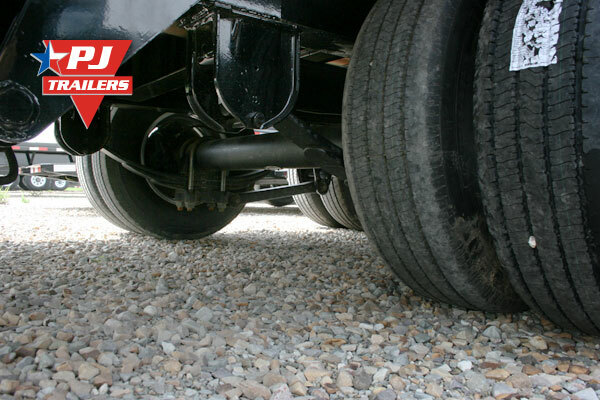 Hutchens Industries also has an excellent reputation for building the highest quality suspension components in the industry. 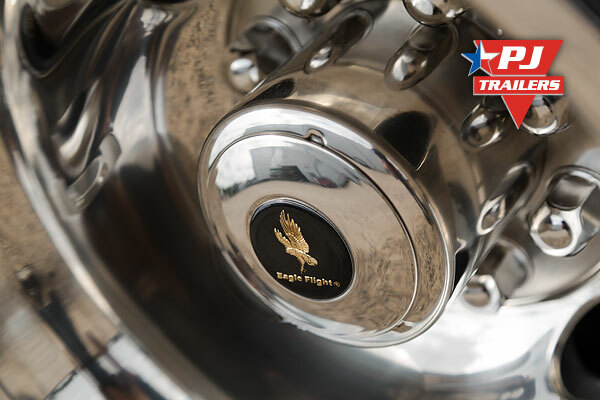 This is one of our most popular options for high mileage hot shot drivers and heavy equipment haulers. This option has even become quite popular on our 10-14 ton tandem dual dump trailer. PLEASE NOTE There is only one genuine Hutch Suspension and that is made by Hutchens Industries. 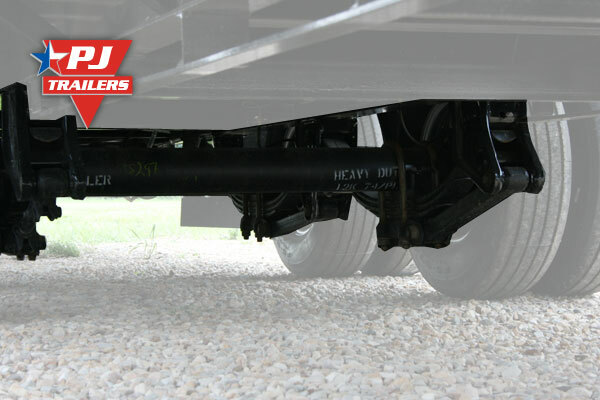 Over the years many people have tried to confuse trailer buyers by telling them they are getting a Hutch suspension when it is simply nothing more than a poorly designed and built knock-off. 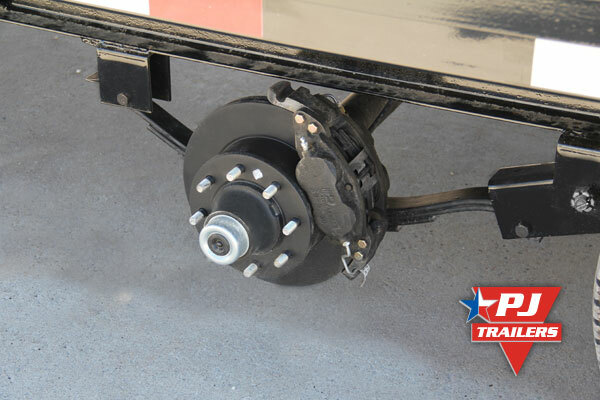 You should also consider if you buy a trailer with a fake Hutch suspension if repair parts will be easily available or even available at all over the life of your trailer. Hutchens Industries made a great series of videos that highlight the difference between their genuine suspension and the knock-offs. 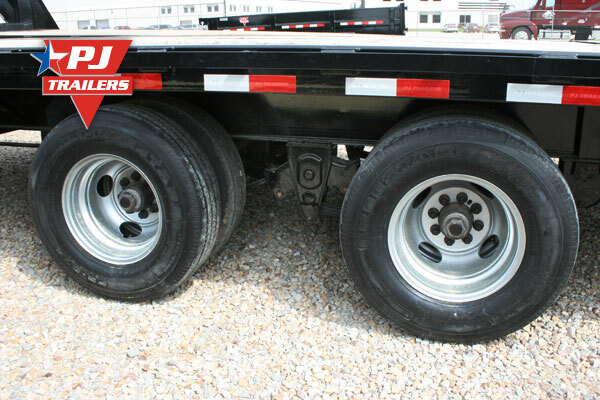 One of the coolest ways to customize your PJ gooseneck trailer is a with a set of stainless steel wheel simulators. These simulators mount over the the steel wheel and are made from mirror polished stainless (giving them a chrome appearance). They are extremely easy to install and remove. 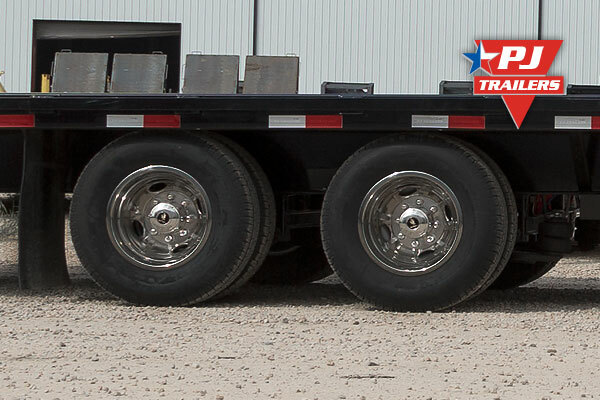 They fit 16″ 8 Lug Dual Disc Wheels (tandem dual trailers). They also have a lifetime limited warranty and are sold in sets of four (4). 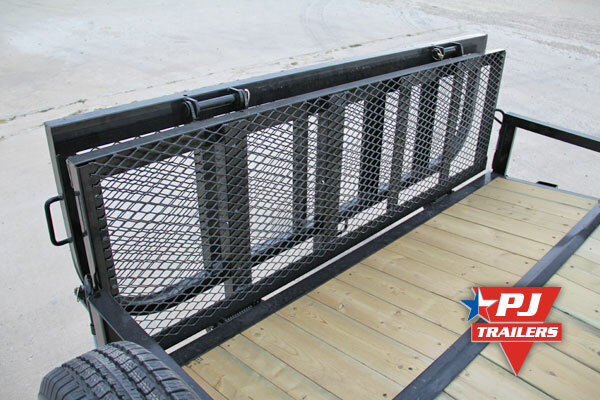 One of the hottest utility trailer options is our bi-fold gate. This gate is hinged in the center, allowing the gate to be folded in half. 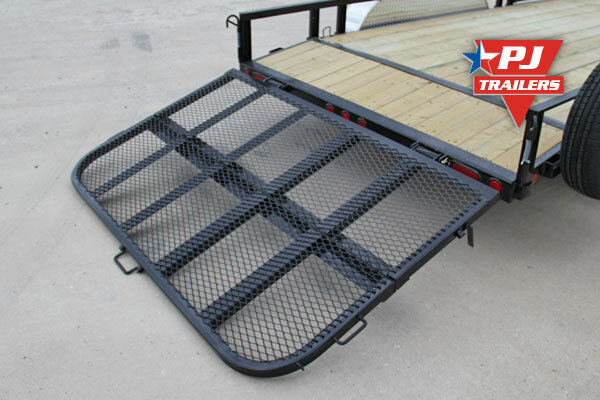 This greatly reduces the wing drag of the gate, which in turn improves the fuel economy of the tow vehicle. 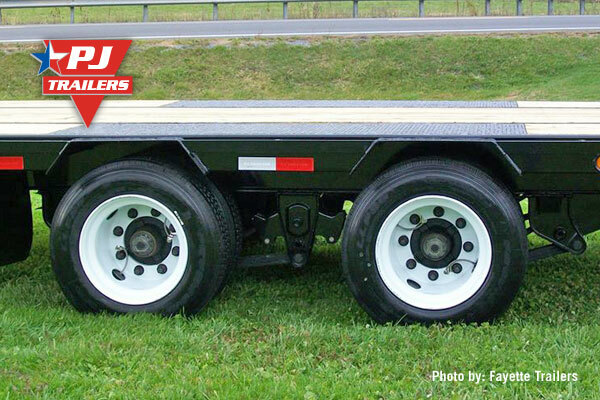 It also increases your visibility when towing and backing your utility trailer. 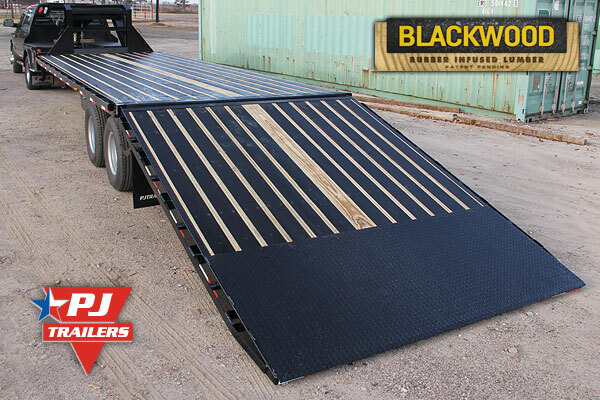 The bi-fold gate is available on PJ utility and 7k car hauler models. It is also available on trailers with 2 ft (see photos below) and 4 ft dovetails. 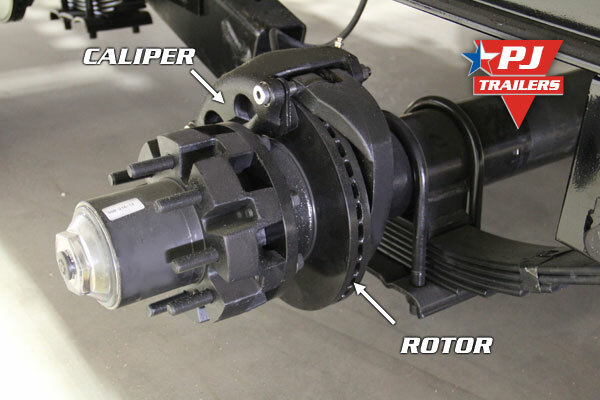 We get a lot of questions about hydraulic disc trailer brakes so we setup a new page to explain how they work and why they outperform electric brakes. Hydraulic disc brakes outperform electric brakes with more stopping power and less brake fade. 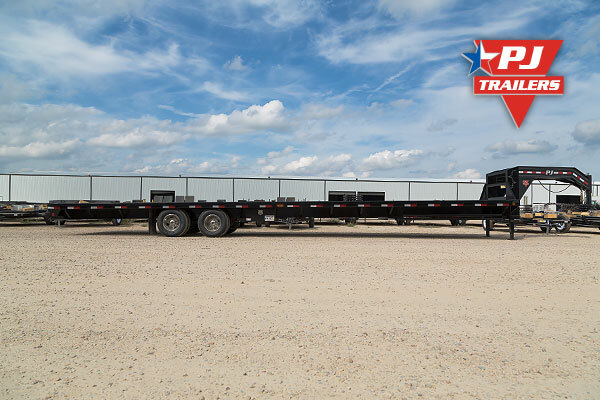 These performance advantages are especially evident in heavily loaded trailers or trailers being towed through areas with steep downhill grades. Also, high mileage hot shot trailer buyers almost always order their trailers with hydraulic disc brakes. High mileage customers agree that hydraulic disc brakes are cheaper to maintain per mile than electric brakes. What special equipment does my towing vehicle need to use hydraulic brakes? The hydraulic actuator that applies pressure to the trailer brakes is installed in the gooseneck or tongue of the trailer, not the tow vehicle. All your towing vehicle will need is an electric brake controller and 7 way plug, just like you would tow a trailer with electric brakes. 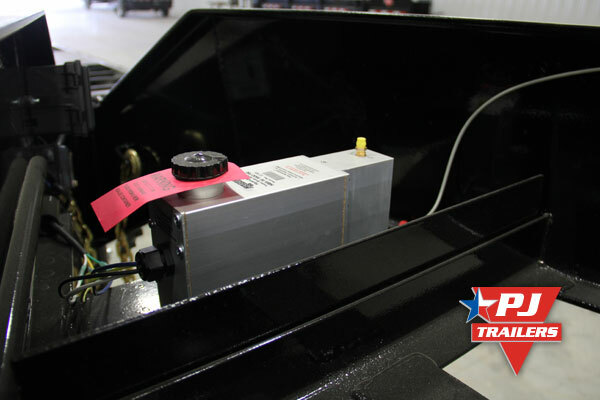 For the Hydrastar actuator it is recommended that you use an aftermarket brake controller, not the factory integrated brake controller that some newer trucks are equipped with. We have created a trailer lumber guide that helps you make the choice between our four wood trailer deck options. This guide explains the benefits of each lumber type. 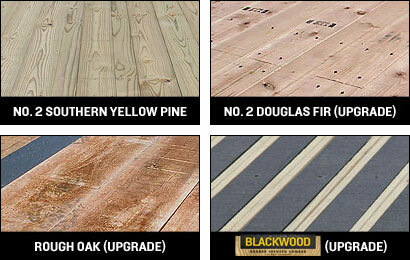 Our four lumber options are as follows. We are super excited about a brand new (as in never been offered to the public!) lumber product that will be available exclusively on open PJ Trailers. Blackwood Rubber Infused Lumber is wood product that has a rubber strip inserted along the length of the board. It offers better traction, durability, longevity, and safety.